Eryops. 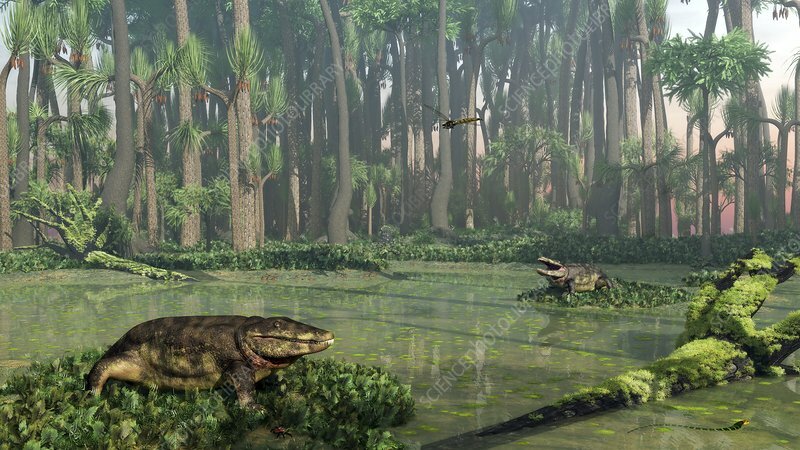 Computer artwork of two Eryops prehistoric amphibians in a Carboniferous swamp, 300 million years ago, in what is today North America. This predator measured up to 2 metres in length and weighed around 90 kilograms. It probably spent most of its time in the water, and like modern crocodiles probably fed on fish and other swimming vertebrates. Also seen is a snake-like, legless amphibian from the genus Ophiderpeton (lower right) and a dragonfly-like insect from the genus Meganeura. The tree-like plants in the surrounding forest include Sigillaria scutellata and Lepidodendron aculeatum.